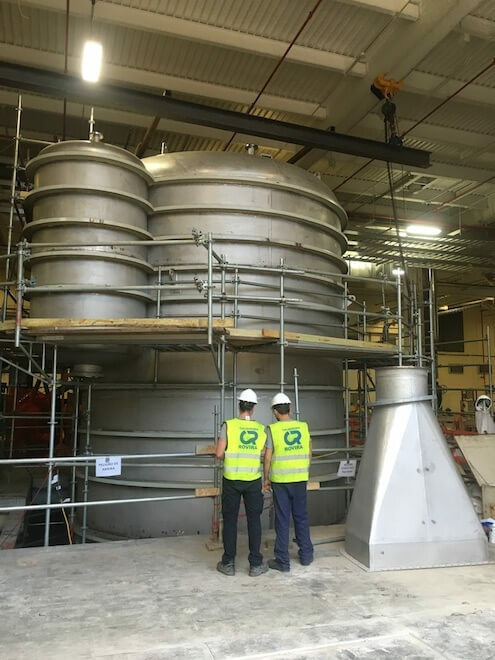 Caldereria Rovira has designed, manufactured and assembled a Silo Pit and Constant Level Box for Allimand, French manufacturer of paper machinery. The design of this equipment was made according to ASME due to they work under negative pressure. Additionally, a seismic study was conducted to ensure proper operation. The Silo Pit is a storage tank Ø4800mm and 10250mm high and the Constant Level Box is a level vessel with an internal separator. Both elements work as auxiliary equipment of the paper machine and have been manufactured in stainless steel 1.4404 and polished inside Ra <0,4?. The equipment assembly was carried out at Suominen Nonowens’ factory in South Caroline (USA) because the dimensions did not enable to be transported in one piece.